Filipinos are fond of beauty contests and thus the Filipino Spouses of Korean Association (FSKA) is holding a pageant for foreign women in Korea, single or married. The event will be held in March and there are cash prizes to be won. The deadline for submission of application in on January 23rd. The screening and orientation will be held on February 1st at 9th Floor of Seoul Global Center Bldg near Jonggak Station. 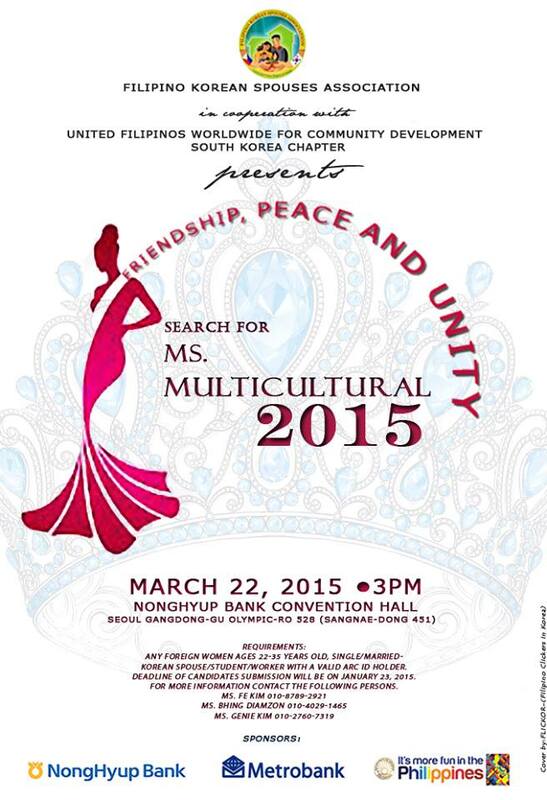 Everyone is invited to join regardless of nationality ~ Filipino, Vietnamese, American, Indonesian, Brazilian, etc. You’re all welcome to apply! For additional information, please visit the event page on Facebook.